Any band that calls itself an "Ordeal" gets a certain amount of respect right off the bat. When the band is as solid as Cathryn Beeks' band, the odd name ceases being a stunt and becomes hip. 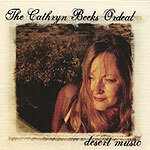 It all starts with Beeks, of course, and her husky, rough vocals give her singing a tomboy-ish charm  a charm only amplified by the quality of the country-folk-rock music on her new CD. Originally hailing from Lancaster, up in the shadow of Edwards AFB in the high desert, Beeks' sound is heavily influenced by the late Gram Parsons. Like his early 1970s recordings, her music is a seamless blending of country, folk and rock. Throwback to the '70s in that regard, perhaps, but there's also a freshness and vitality about this recording that makes it absolutely of the present. All 12 songs were written by Beeks, either alone or in partnership. All are melodic, accessible and likely to get stuck in your head. Highlights include the anthemic "Special Words," the travel ode "Drive America" and the honky tonk "2 Beer Buzz." The production by Jeff Berkley (of local faves Berkley-Hart) is ultra-clean; the band, as mentioned, is rock solid. Hard to go wrong in laying out your hard-earned coin for this release.